Last year, we joined a group to trial run the Archives and Records Management Framework (ARMS) – a self-evaluation scheme to assess archive services. ARMS is still in development and is led by the Scottish Council on Archives (SCA). For more information about the process, please see http://www.scoarch.org.uk/projects/qualityframework. In June we filled in the paperwork for our contribution to the ARMS pilot, providing information on how we make sure that the collections are preserved and listing evidence to support our self-evaluation. Yesterday the validation team visited us to look at the documentation for our self-evaluation and assess it. The team was made up of representatives from SCA, the National Records of Scotland, and Glasgow City Archives. In the four hours the team was with us, we discussed LHSA’s accession policy, storage conditions and planning in the event of a disaster. The team also had a tour of one of our stores and the exhibition room. At the end of the visit we talked about ARMS itself and how it might be improved after the pilot phase is finished. In general the validation team agreed with our own assessment of the quality of LHSA’s services to preserve the collections. They seemed impressed by the work already undertaken and by the direction planned for the future. But our work with the ARMS pilot is not quite over yet! We'll receive a report of the validation team's findings soon, and be invited to a meeting for all the archives involved in the pilot to discuss further development of ARMS. 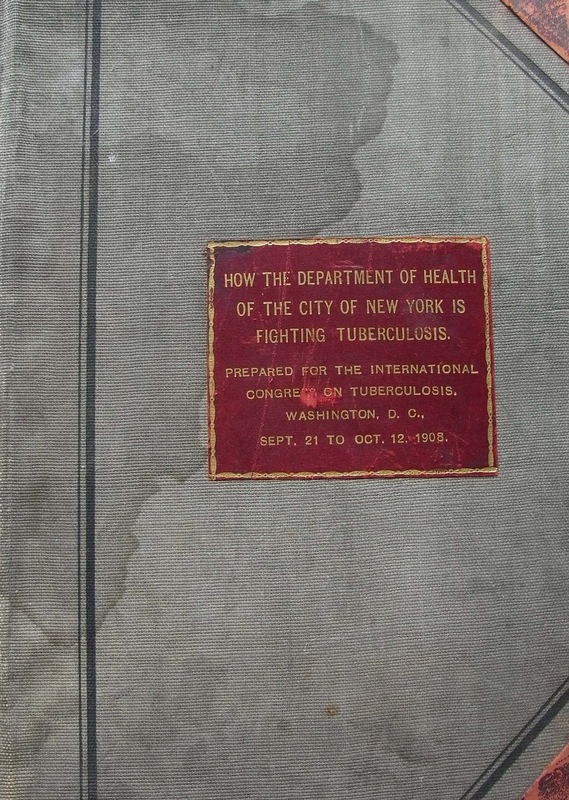 Last month we received a call from the Royal Victoria Hospital asking us to collect some historical items found within their offices, including this book prepared for the fifth International Congress on Tuberculosis (TB), held in Washington D.C. from 21st September to 12th October 1908. 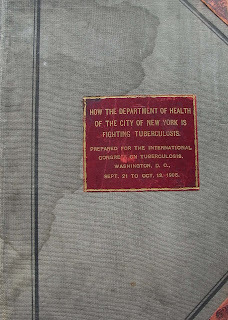 Part report and part scrap book, it sets out the measures taken to tackle TB by the Department of Health in New York, a city of over four million people by 1907. It contains a range of sample information notices, dispensary cards and forms to be completed by medical practitioners. 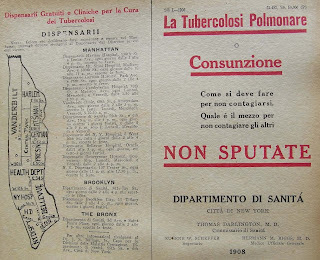 The educational resources reflect the twin aims of firstly, trying to prevent the spread of the disease, (chiefly rallying against the “filthy habit of spitting”, and secondly containing and treating those who found themselves with the disease. It reflects the challenges of trying to communicate this message to a diverse population: all of the notices and forms are in several languages including German, Italian, Russian, Greek and Polish. 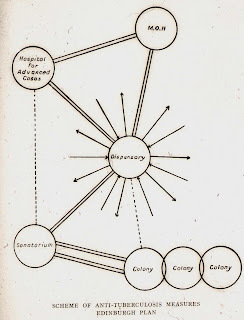 The chart below bears strong similarities to the famous Edinburgh Scheme devised by Sir Robert Philip of the Royal Victoria Hospital (RVH) some years earlier. 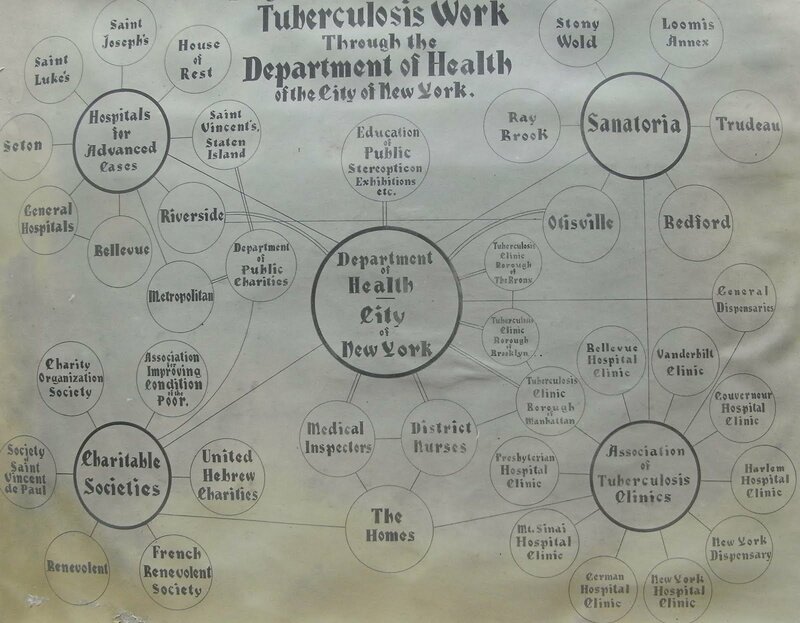 Dr Philip had set up the first TB dispensary in the world and helped to found the RVH in 1894. 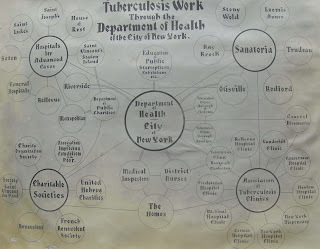 It is likely that he or another doctor from the RVH attended the Congress and brought this item back to the hospital, where it remained for over 100 years before being transferred to LHSA. 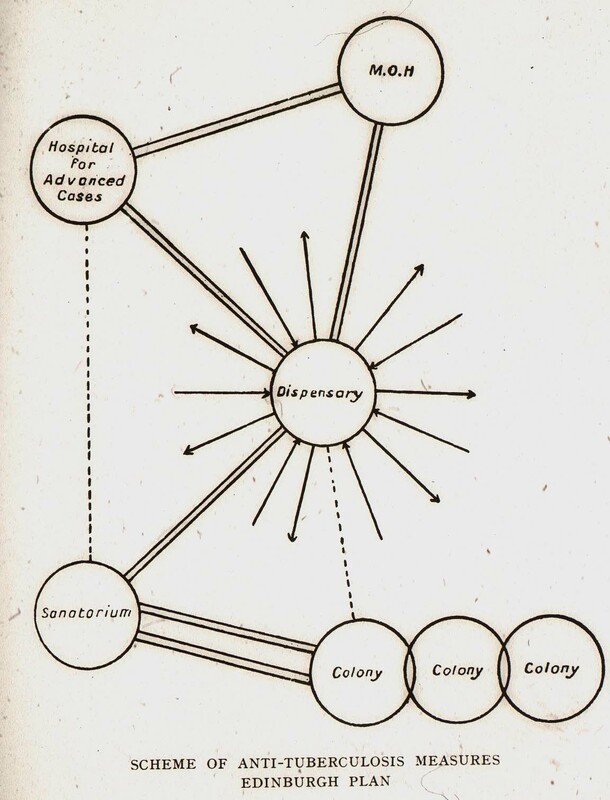 Sir Robert Philip's "Edinburgh Scheme"
For more information on the RVH, please see our catalogue: RVH catalogue. 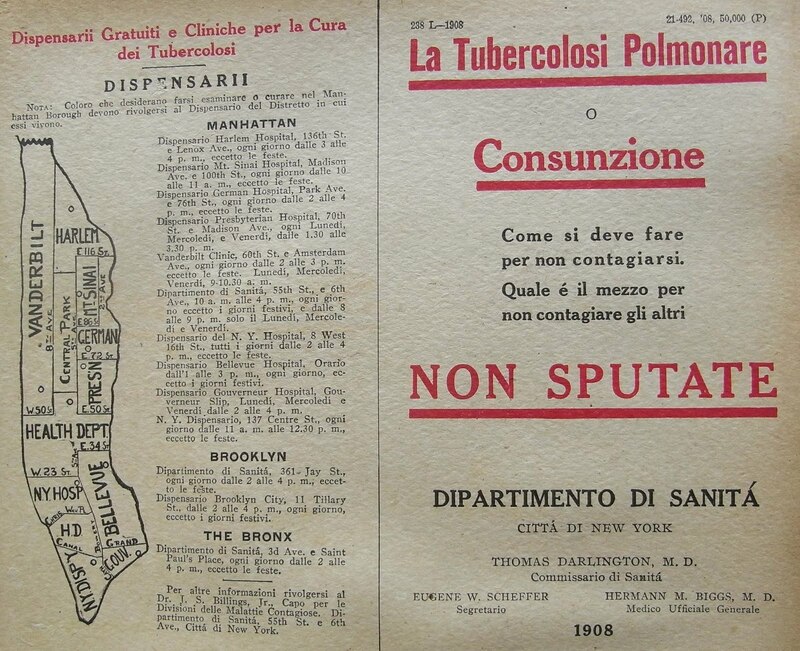 For more information on the history of TB treatment, please visit our Tales from the Archive pages: Tales from the Archive: treatments for TB. This week Ruth, our Paper Conservator, carried out preliminary treatment of an accession that came to LHSA last year – some minutes of meetings held at the Royal Edinburgh Hospital (REH) in the 1950s. They had accidently got wet before they were accessioned by us, and were in pretty poor condition. 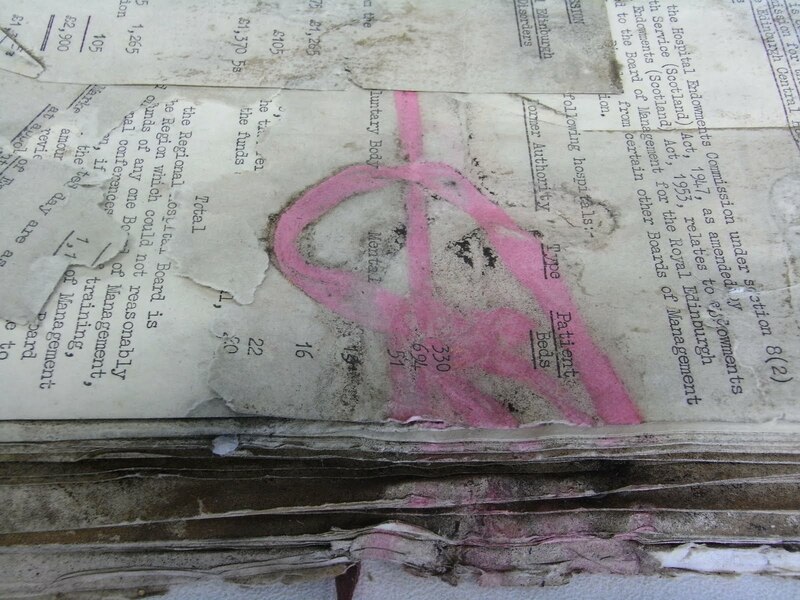 There was lots of damage caused by mould and the papers had stuck together in a solid block! This meant that the minutes couldn’t be catalogued until they had been separated and cleaned. It took a long time as rusty metal paperclips had to be removed and each sheet separated from the one next to it by sliding a very thin spatula between them and then prising the top sheet free. This had to be done very carefully to make sure that Ruth didn’t cause any more damage to these already fragile papers. 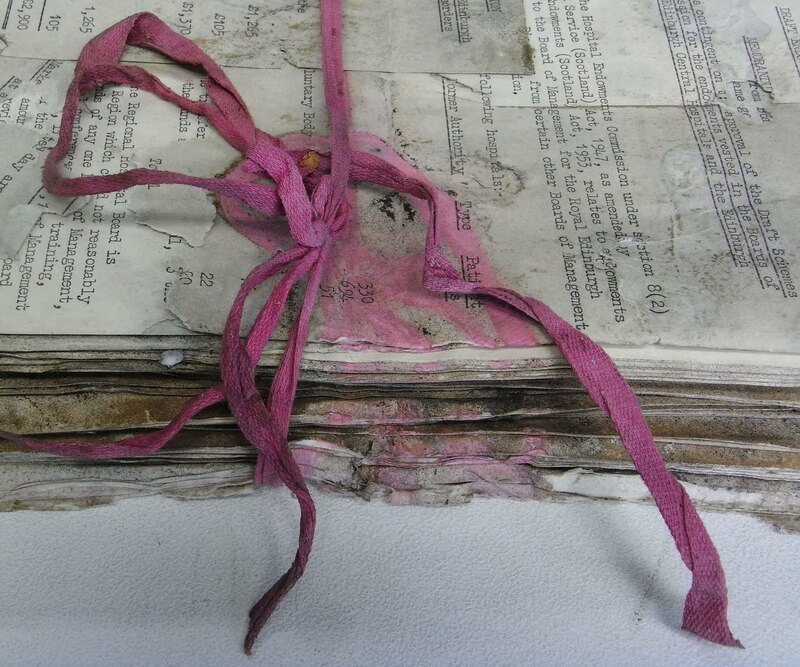 While Ruth was separating the papers she found an excellent illustration of why pink tying tape shouldn’t be used in archives! The water had made the dye run and there was a perfect impression of the tied bow on the paper beneath the pink tape. Ruth then cleaned the papers and re-housed them, and they will now be added to the catalogue of our extensive holdings that relate to the REH. 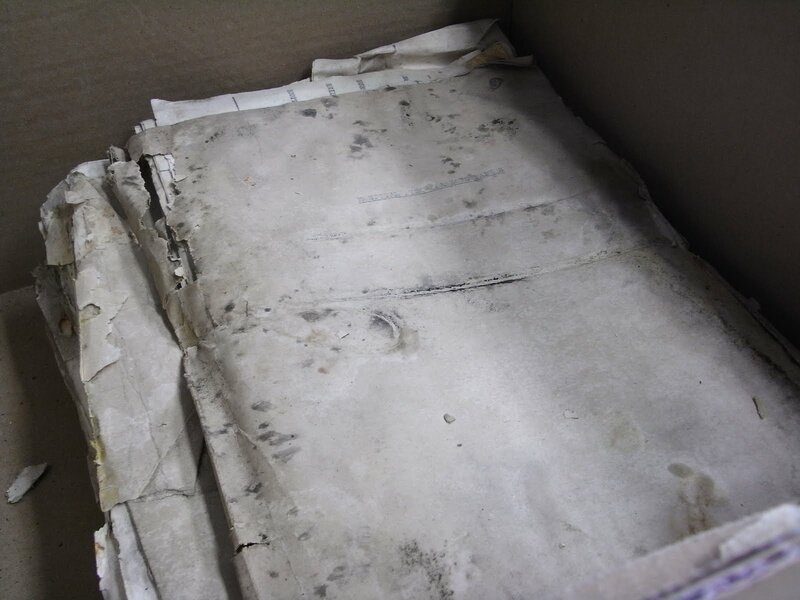 These papers need more conservation treatment to make them easily usable without risk of causing further deterioration, but this will be carried out once they have been catalogued. An important task completed recently was the conservation and re-housing of about 70 architectural plans. 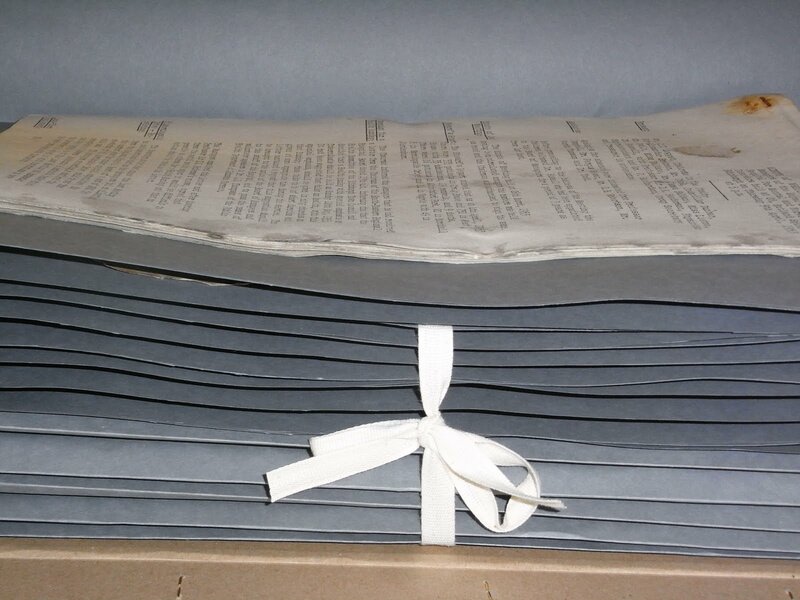 These had been rolled when they were taken into the Archive, and they were difficult to access and identify without damaging them. The first job was to conserve the plans. 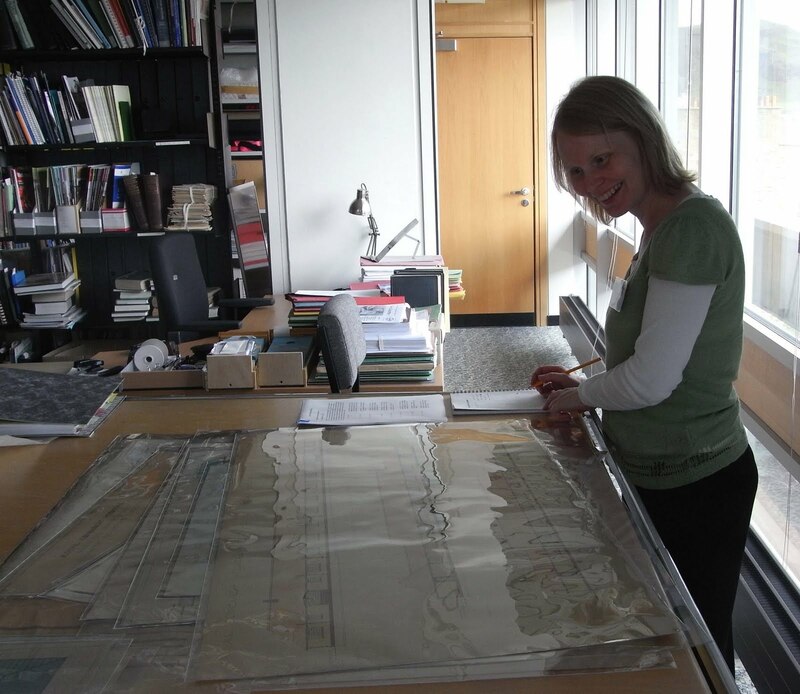 Surface cleaning and tear repair were carried out by Ruth, the Paper Conservator, with help from specially trained volunteers. The plans were then pressed so that they could be stored flat in transparent sleeves made of inert plastic (Melinex®). Stephen, the Archive Assistant, made sleeves for each plan by welding two rectangular sheets of Melinex® on three sides. For plans below a certain size pre-cut sheets were used, but for the larger ones the Melinex® was measured and cut to size from a roll using a scalpel. Ruth then carefully slid each plan into its sleeve and attached an identifying label to the bottom right corner. The re-housed plans were then carried in bundles of about 15 in a plan carrying folder to their new permanent home: a plan chest in a climate controlled store room. Laura, the Assistant Archivist allocated empty drawers for the plans to go in and recorded all the changes of location into the Locations Database, before identifying suitable plans for small cataloguing projects. Our most recent one-day volunteer, Lynne who featured in last week’s blog, began to catalogue these plans so that our readers can easily identify and select the ones they want to view. 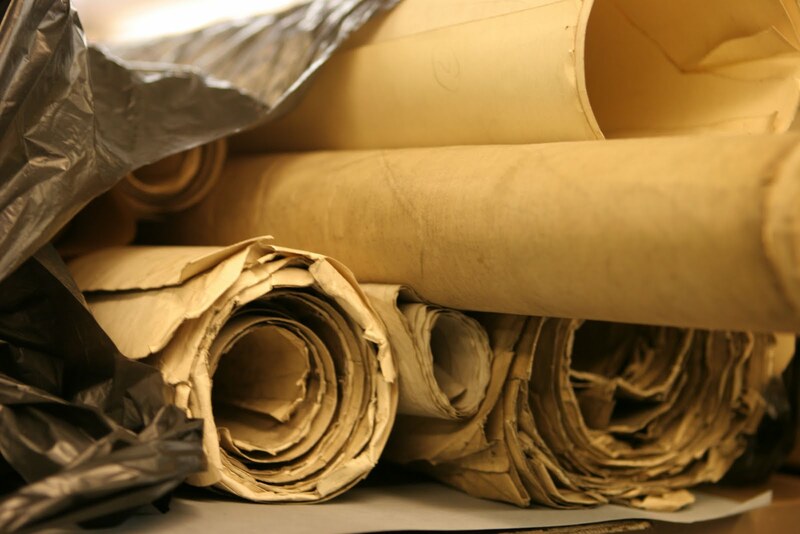 We will continue to catalogue the conserved and re-housed plans to ensure that they are accessible for research use. 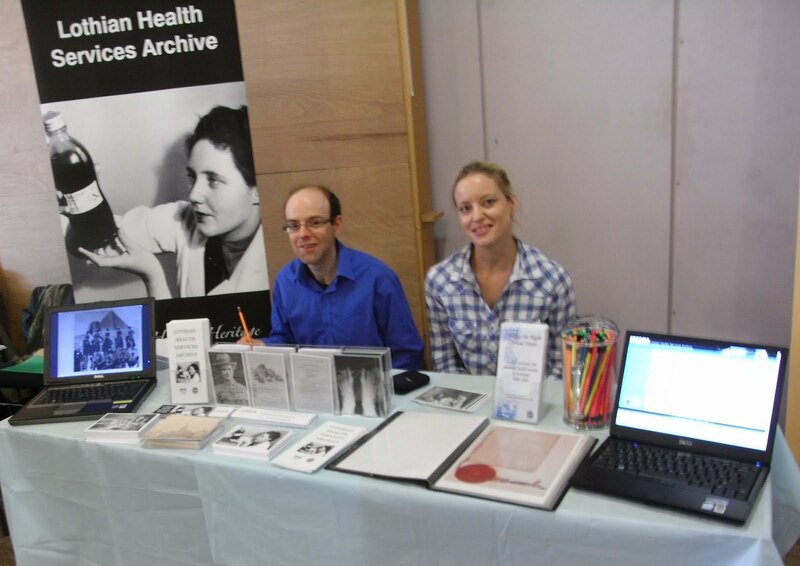 This week we’ve been busy promoting the Archive to family historians and trainee archivists alike. On Saturday we had a stall at the Scottish Association of Family History Societies conference and fair. This was a chance for us to speak to family history researchers about the wealth of information that can be found within our collections. The fair attracted a big crowd; we came away lighter on the pencils and postcards front (which were a big hit) but picked up lots of new enquiries! On Friday we were joined by Lynne MacMurchie for a one day volunteer placement. Following on from the success of trials earlier this year, we were able to offer Lynne the chance to spend a day in the Archive and provide a taster of what it’s like to work here. After a tour of the Archive with an introduction to the reading room and stores, Lynne helped out by conducting some family history enquiry research on Bangour Village and Rosslynlee Hospital records. She was then given training on how to handle and catalogue Royal Edinburgh Hospital (REH) architectural plans: in the run up to the REH bicentenary in 2013, it’s all hands on deck to get the remaining plans catalogued so thanks to Lynne for her help!